Save Time. Say goodbye to workarounds when you streamline processes and automate tedious paperwork tasks. Save Dollars. Keep your money in the bank with a new level of control and a high level of productivity, whether for the simplest – or the most complex – business process. I need to know the other 8 things! 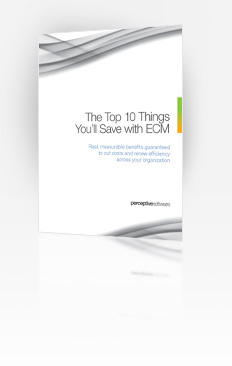 Give me my free copy of “The Top 10 Things You’ll Save with ECM”. Can't wait? Learn more about Perceptive Software technology now.